Artists including Leon Golub, George Cohen and Nancy Spero created existentialist art in an anxious postwar era. Their work was largely figurative, unlike the prevailing Abstract Expressionism of the time. The first major exhibition of the Monster Roster just opened at the Smart Museum of Art on the campus of the University of Chicago and runs through June 12. “Chicago Tonight” got an early look at this uncommon artwork. Leon Golub, Siamese Sphinx II, 1955, Lacquer on Masonite. Private Collection. Cosmo Campoli, Birth of Death, 1950-1951, Cast bronze. Smart Museum of Art, The University of Chicago, Gift of Joyce Turner Hilkovitch in memoriam of Jonathan B. Turner, 1991.357. George M. Cohen, Man with a Dog, c. 1950, Oil on board. Courtesy George Cohen Estate. Ted Halkin, Angel, 1953, Oil over gouache on board. Collection of the Illinois State Museum. Seymour Rosofsky, Patient in Dentist's Chair, 1961, Oil on canvas. Smart Museum of Art, The University of Chicago, Gift of the Rosofsky Estate, 2014.16. Phil Ponce: Foreboding figures populate the paintings – and sculptures – of the artists of the Monster Roster. John Corbett, co-curator: I think what they were onto was what we now think of as the “age of anxiety,” and they were early comers to the anxiety that Americans experienced in the postwar period, in the sense that there was a euphoric feel to success in the war but at what cost. Jessica Moss Jessica Moss, Smart Museum of Art: A lot of these artists had just served in WW II and had returned and were going to art school on the GI Bill. You can see a direct influence in the works of the Holocaust and war themes and sort of the struggle and the darker side of the human experience. Ponce: But it wasn't all doom and gloom. Corbett: It was a view that has a bleak exterior and a really optimistic interior in a way, which is that it’s looking at the potential for regeneration and rebirth, but it's all seen through the potential annihilation of humanity [laughs] so it is bleak. And it’s something posed in a philosophical manner, it’s reflective, it’s thinking about whether or not there are things that can be done and it’s causing people to look inward, really encouraging people to spend some time thinking about what inner demons they might have. Ponce: The artist and critic Franz Schulze named the dozen or so artists “The Monster Roster” for their subject matter – and as a reference to the “Monsters of the Midway,” nickname of the University of Chicago football team. John Corbett Corbett: The Monster Roster was not a group in itself, it did not call itself a group, they didn’t band together. They were friends and colleagues and they all knew one another. There are 16 unique artists in the show and not only that, but their work changes over time, so you have quite a stylistic diversity. But there are things that really pulled them together, there’s a lot of expression in the work. You’ll notice that the work is almost all figurative and in that sense was a response to the predominance of abstract expressionism in that period. There are craggy surfaces; there is a kind of overall crumblingness to some of the images. On the other hand, certain painters are much more – let’s say “slick” – it depends a lot on the personal proclivities of the artist. Moss: They share a lot of similar sources of inspiration for their work. They were looking at self-taught art, they looked at ethnographic material, they were interested in psychoanalysis – several of them actually underwent psychoanalysis themselves as a form of research for their work. Corbett: The core formed around Leon Golub who was a very charismatic, important artist to all of the other artists, was a leading figure at that time and was the first of these artists to gain national and international recognition. He was here at the University of Chicago and was studying philosophy as well as studying art. Moss: The works are all figurative but there are moments of abstraction in them as well, and certainly the processes and techniques they were using were pretty avant-garde for the time. Leon Golub was scraping canvases with meat cleavers or sticking two wet boards together and pulling them apart. The figure was central but they were exploring it in pretty adventurous ways. Ponce: In a side gallery, the exhibition gives a nod to the Chicago Imagists who emerged a decade after the Monster Roster and the artists, like Jean DuBuffet, who influenced the Roster. Overall the show gives a rare and thorough view of this under-appreciated group of fiercely creative Chicagoans. Corbett: The Monster Roster has been subjected to smaller shows, not full-scale surveys, going back into the ‘50s and ‘60s, but there’s never been a show of this size and scope, really looking at pulling them all together, defining where the boundaries are, who’s in, who’s out, and that’s of course open for debate. We’re happy that this may put on the table something that someone could argue with. 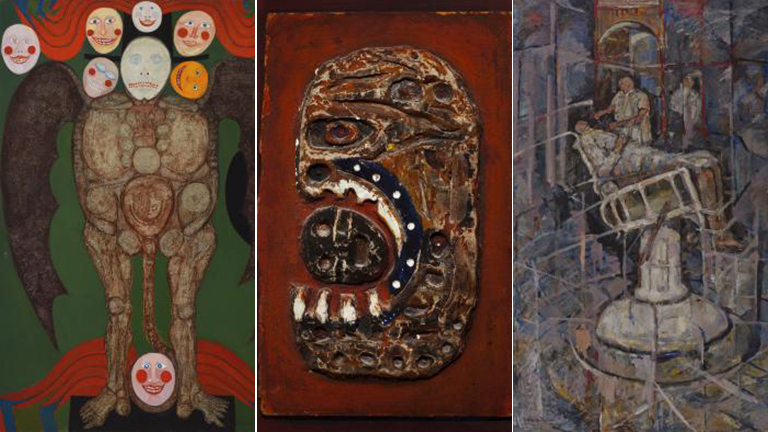 The show is called “Monster Roster: Existentialist Art in Postwar Chicago.” It opened today at the Smart Museum of Art on the University of Chicago campus and it continues through June 12. Below, an excerpt from the introduction of the exhibition catalog, written by art historian and critic Dennis Adrian. The term “Monster Roster” used in the title of the present exhibition does not refer to a specific or limited group of artists working in the Chicago area of the 1950s and early 1960s. Apparently, there were no attempts during this period to present a comprehensive group exhibition of works associated with this artistic current, and there is no official list of individuals belonging to a formal group identified by this moniker. In fact, at present there is no evidence that any of the artists in the present exhibition ever used the term “Monster Roster” to identify themselves. So there was no formal artistic movement calling itself Monster Roster. Franz Schulze—one of the so-called Monster Roster artists, who was also a young art critic in the late 1950s—has reliably reported that the term “monster” was first used in 1958 or 1959 by the art historian, University of Chicago alumnus, and Museum of Modern Art (MoMA) Curator of Painting and Sculpture Exhibitions Peter Selz to describe a newly emerged artistic direction among some Chicago-based artists, several of whom Selz intended to include in his 1959 New Images of Man exhibition in New York. In the MoMA show, Selz presented Cosmo Campoli, Leon Golub, and H. C. Westermann in relation to recent expressive figurative developments in painting and sculpture in the vanguard art worlds of Europe and the United States. The earliest probable recorded national use of “Monster Roster” appeared in a February 1959 article in the journal ARTnews, where Schulze used this term to summarize the activities of an established figurative direction in Chicago among a diverse number of recently established painters and sculptors working in some kind of expressive figuration. Because of the widespread subsequent use of the term among critics, dealers, curators, and collectors, and in consideration of the many shared themes and prominent employment of human figural motifs among the artists themselves, the moniker “Monster Roster” remains current as an art historical designation. The nature of these figurative tendencies in Chicago art often centered on intense feeling about the human condition at the time—famously the subject of the Anglo-American W. H. Auden’s 1946 poem The Age of Anxiety: A Baroque Eclogue, and the writings of the sociologist and commentator on American society David Riesman, most of all his influential book The Lonely Crowd, which he published in 1950 while a professor of social sciences at the University of Chicago. The writings by Jean-Paul Sartre, Simon de Beauvoir, Albert Camus, and Jean Genet, among other existentialist thinkers in France and elsewhere, were also popular among this new generation of Chicago artists. A number of the artists later known as the Monster Roster served in the military in World War II, and the sentiments and feelings that appeared in their paintings and sculptures reflect the trauma of the horrors of that war, as well as the uncertainties of the Cold War, and the potential for worldwide annihilation that accompanied the Nuclear Age. However, none of the paintings, sculptures, drawings, and prints by them directly illustrates specific contemporaneous events or atrocities. Instead, they embody more generalized images of suffering of the type experienced throughout history and by millions during the war and in postwar regional conflicts, including the Berlin Blockade and the Korean War. Reprinted with the permission of the Smart Museum of Art.